This is craziness. With my mad schedule sucking up every nanosecond of my time, and Blogger being down for extensive repairs (wasn't that awful? ), I haven't even bothered to post a link to my first-ever podcast! Last week, I had a fun conference call with Nathaniel Rogers of The Film Experience, Michael Cusumano of Serious Film, and Robert, who does the excellent "Distant Relatives" series at Nathaniel's site. This was a new and terrific experience, and I'm itching to do it again. 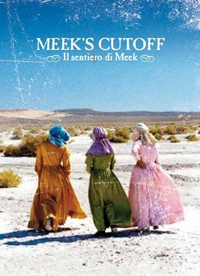 The four of us chatted about growing up movie-obsessed, sharing film love with our loved ones and two movies I loved and loathed with equal vigor: "Meek's Cutoff" and "Water for Elephants." The conversation is posted over at The Film Experience. CLICK HERE to give it a listen.